We provide crop production, sourcing and supply management of raw fruits, vegetables and other commodities for the food processing and packing industry. 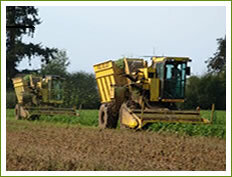 Established January 2007, our members are growers and managers from the processing food industry. Our staff are full time experienced Agriculture Managers with more than 100 years of experience in fruit and vegetable processing and procurement. Our Business Goal is to provide agricultural products to the food processing and packing industry that will assist the customer in exceeding their company's objectives.